Well, I have been lucky for many many years bit I think I am going to start to look for a little extra protection in regards to riding gear, so many years, 4 decades, I have ridden bikes, I have had my share of spills and deals but this lady was lucky and even at only 50 MPH and with all her gear on, she still sustained road rash. 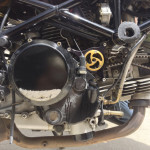 I have followed the Motolady for quite some time and she is a great rider and sometimes there is no reasoning for a low or high side, it can happen on any road lane or pathway. 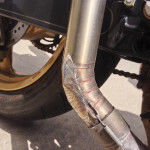 Below is her blog and if you get time, take a moment to soak some of this in, it woke me up today and I feel for her but- if it was not for her protective gear, this would of been so much worse, Motorcycles can be repaired, we take a lot longer to heal for sure. 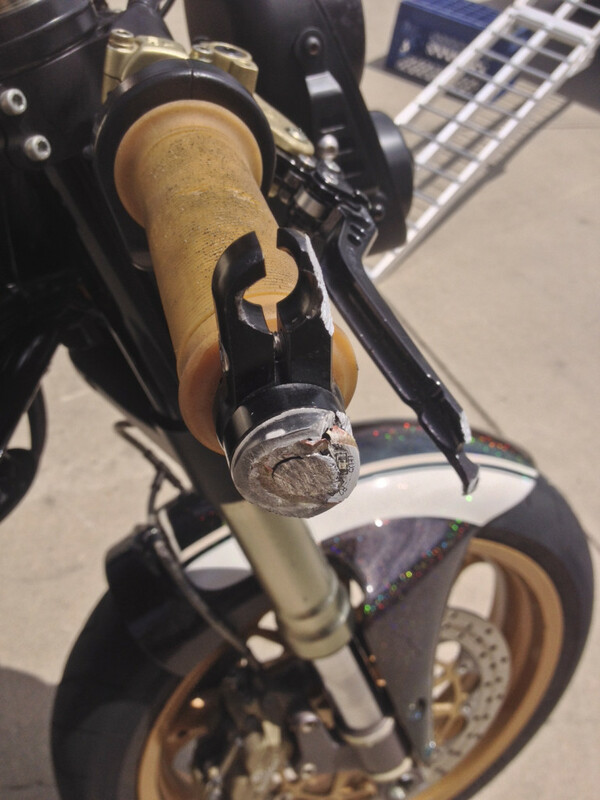 As many of you saw on instagram and facebook on Monday, I crashed the Monster. Being geared up head to toe saved my life. 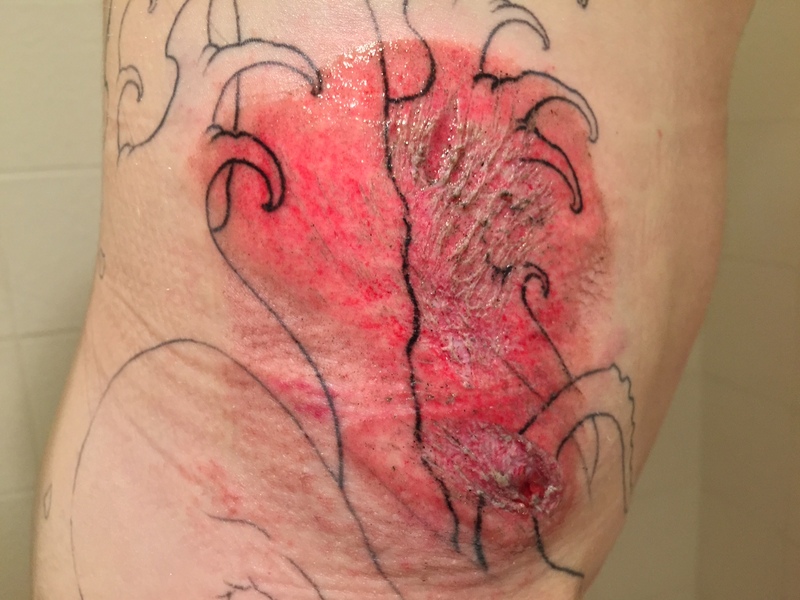 After about five and a half years of riding, I finally had a spill on the street. But it was a little bit more than a spill- it was a 50-55mph crash. Now, the Monster and I are both relatively okay- flesh wounds mostly. I’m bruised all over and have a bout of road rash on my right hip. 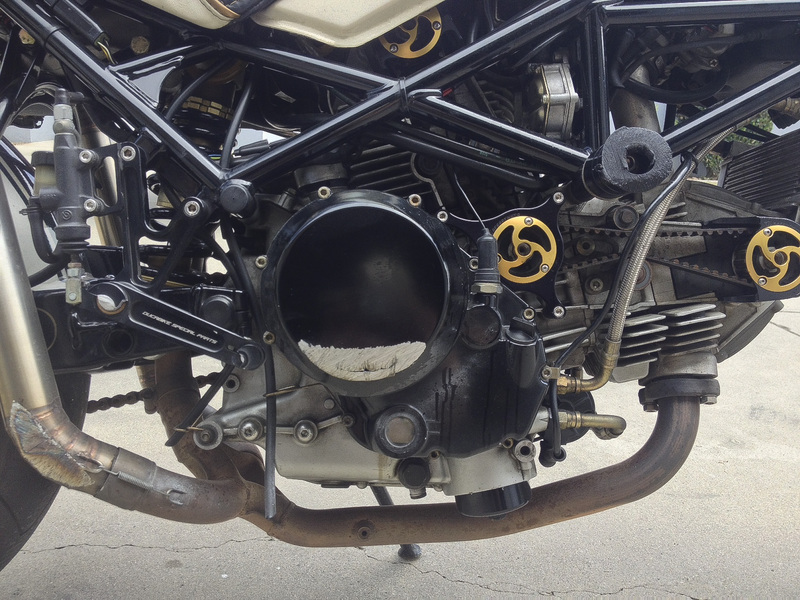 The Monster has damage down the right side. Yesterday at about 11am I left Costa Mesa base camp heading toward LA on the 55 North freeway. I exited right at the 73N/405N freeway onramp interchange, which is a really long two lane sweeping left turn. At about 50 mph, I hit what I thought was a little bump in the roadway and got a speed wobble, which almost immediately turned into a violent tank slapper and I hit the pavement. I didn’t highside- I had a very violent lowside (sort of) where the bike hit the ground rather hard (and with the quickness). We then slid some 75 or so feet to a stop after sliding into the median (in what seemed like slow-mo) and bouncing off. The bike and I ground against the road for a moment together when I lost sight of it, rolling sideways as I skid feet first and then rotated around to point across the lanes. When I finally came to a stop, I immediately got up and started waving my arms so that any oncoming traffic wouldn’t run us over. Luckily for me there were no cars behind me for a half mile or so. Two trucks were the first to pull up and stop in either lane, turning on their hazards and sort of motioning for me to move my crap out of the way. I pleaded with them via hand signals to please help me pick it up, as I’d already tried and the awkward angle and oil everywhere was making it tough. Not to mention my body was a bit beat up. 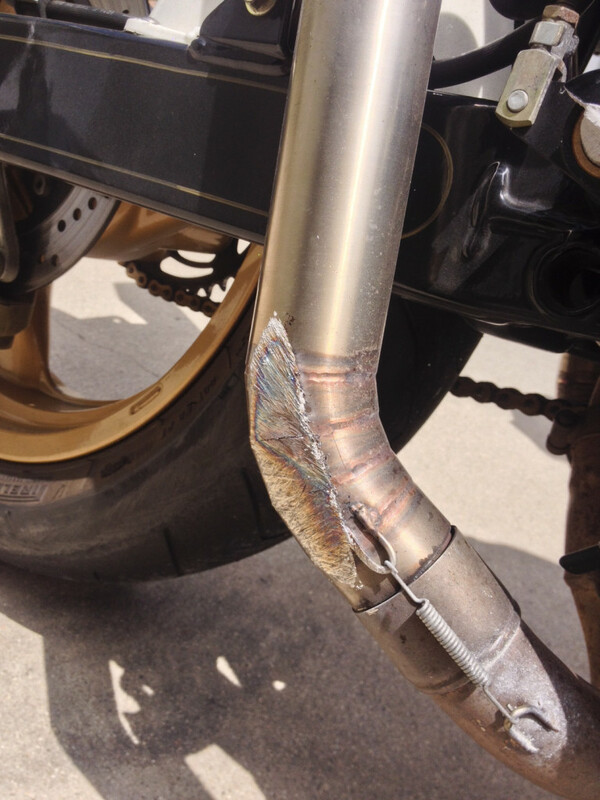 When we tried to roll the bike after it was vertical, something seemed seized. 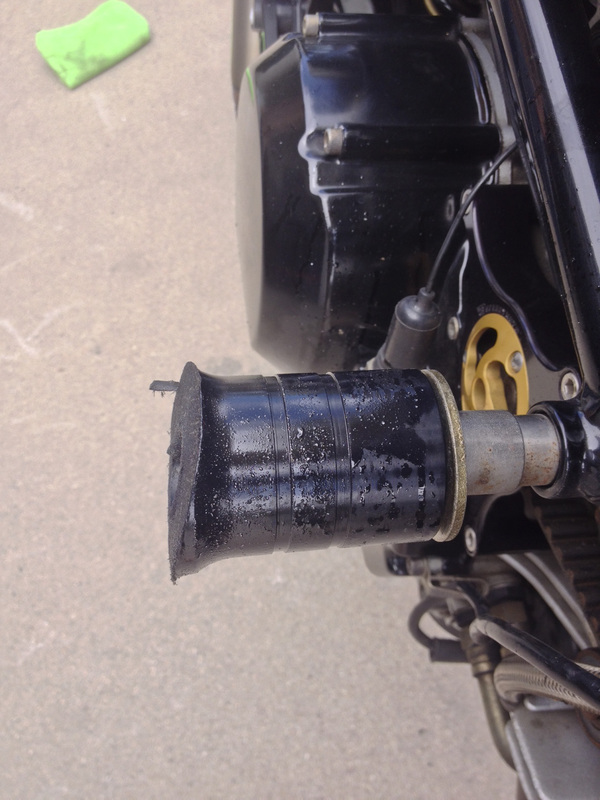 Pulling in the clutch did nothing, shifting it into neutral seemed to have no effect. 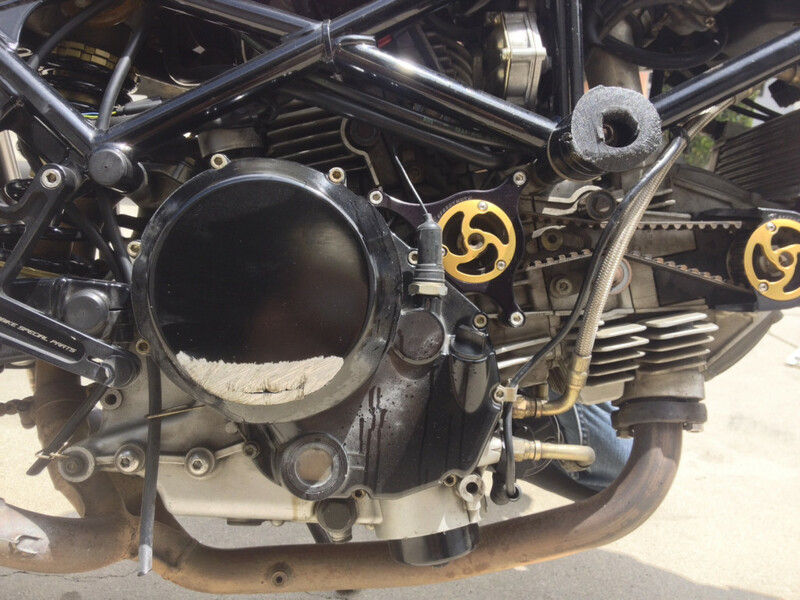 So, we dragged it downhill to the inside smaller shoulder, and the front wheel wouldn’t move. I thanked them and they all drove away. I then called my roommate Will, asking if he could pick me up and bring some gauze for the road rash I noticed on my hip. It wasn’t bleeding profusely but definitely was not pleasant looking. And then I began to wait… traffic flying by. A motorcyclist in sprinter van arrived, parked on the opposite shoulder and asked if he could help transport my bike. When I told him I had someone on the way, he offered to put his hazards on for safety, and asked if I’d prefer to wait in van. Why, of course I would prefer that! Thankful, I waited a moment and safely crossed traffic to wait in an air conditioned space. After a few minutes getting to know Joel, a street rider gone dirt, a tow truck stopped to help. 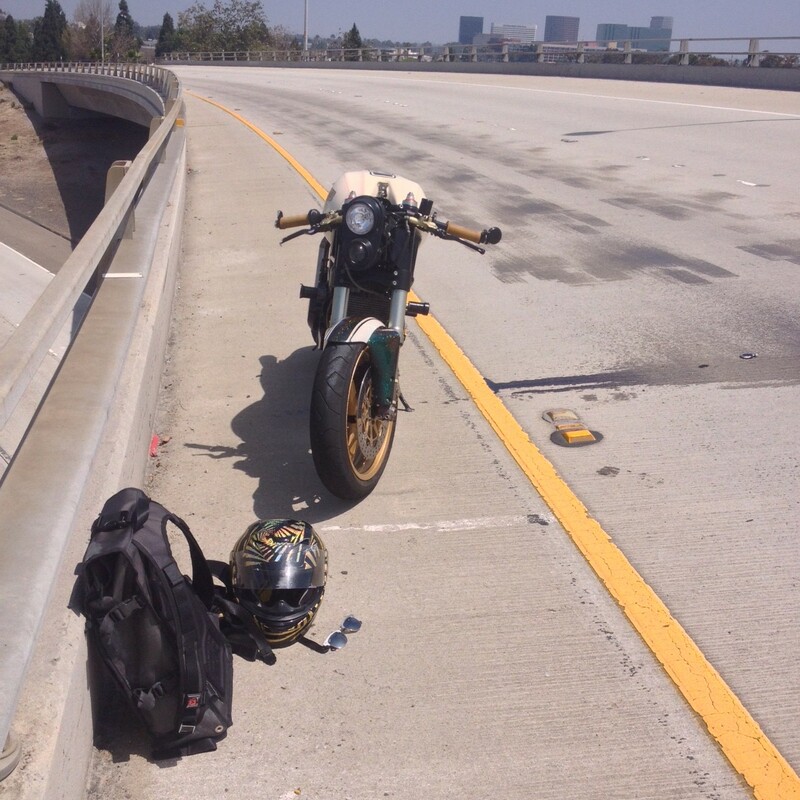 He called CHP, who stopped traffic while Joel and he ran over to move the bike to the safer side of the road. The tow truck driver went through the usual suspects to see what was seized or lodged, and pulled out a big piece of metal from between the front wheel’s mags, brake calipers, and forks. From inside the van I was craning around trying to see what on earth it was- turns out it was a piece of a spare tire mounting bracket. 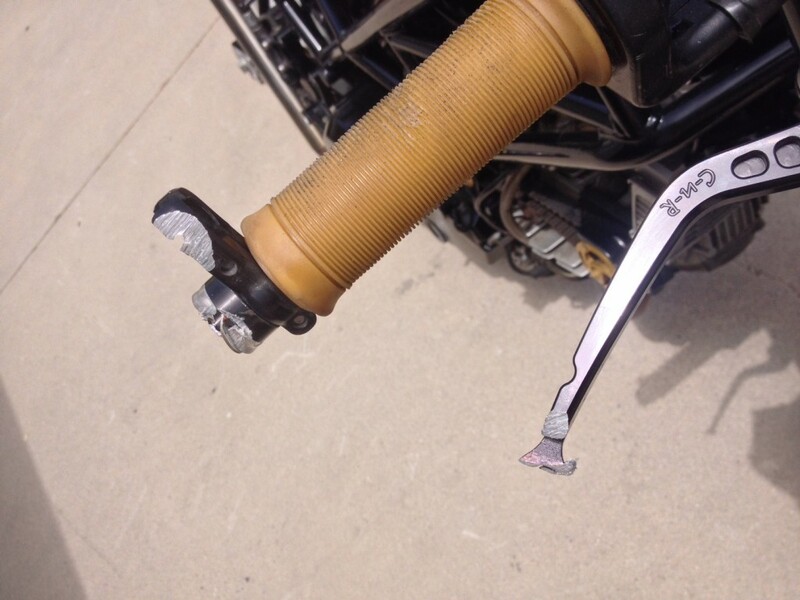 It’s really hard to tell if I picked it up after going down, or if it lodged into the wheel and caused the crash. I have felt and ridden out speed wobbles on the Monster before, as many Southern California freeways and roads have massive potholes and bumps all over the place. 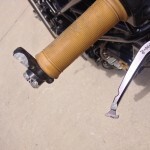 So it’s hard for me to believe that I would crash so immediately and so hard from a little bump in the road when I wasn’t even pushing the bike. But I can’t say for sure what happened, I didn’t have a GoPro on, and I can’t press replay on my mind! So, Will, the roommate, arrived just after the bike got moved and loaded it up into his truck. I moved to the back seat of his Tacoma and put some gauze over my road rash, drank some water and chilled out til we got home. At that point the inspections of injuries, head, and rash began, followed by cleaning. Now, about the state of my dear, sweet Monster. 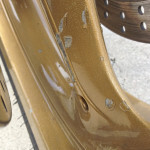 While yes, I was most immediately concerned with how screwed up my bike was, I had glanced at it and hadn’t seen a whole load of damage on my tank or body work at first glance so I was somewhat scared to really look. Upon further inspection, there’s a lot of small damage, and some major stuff that definitely needs fixing. 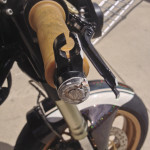 But my SpeedyMoto frame sliders absolutely saved my tank, bodywork, and my swingarm! It was practically a miracle! All in all, I feel incredibly thankful. 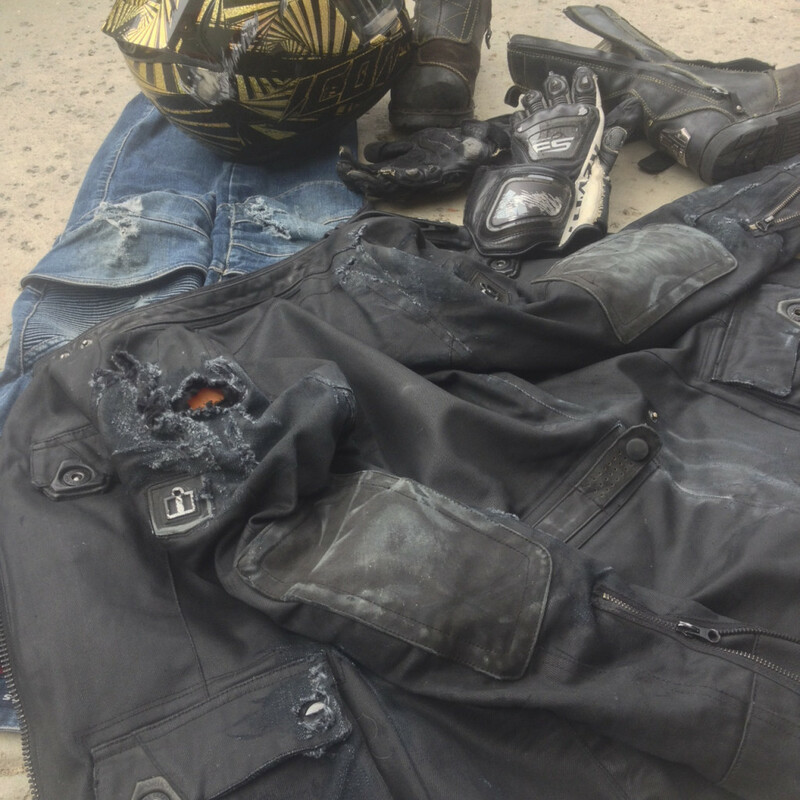 Wearing full gear definitely saved my life. 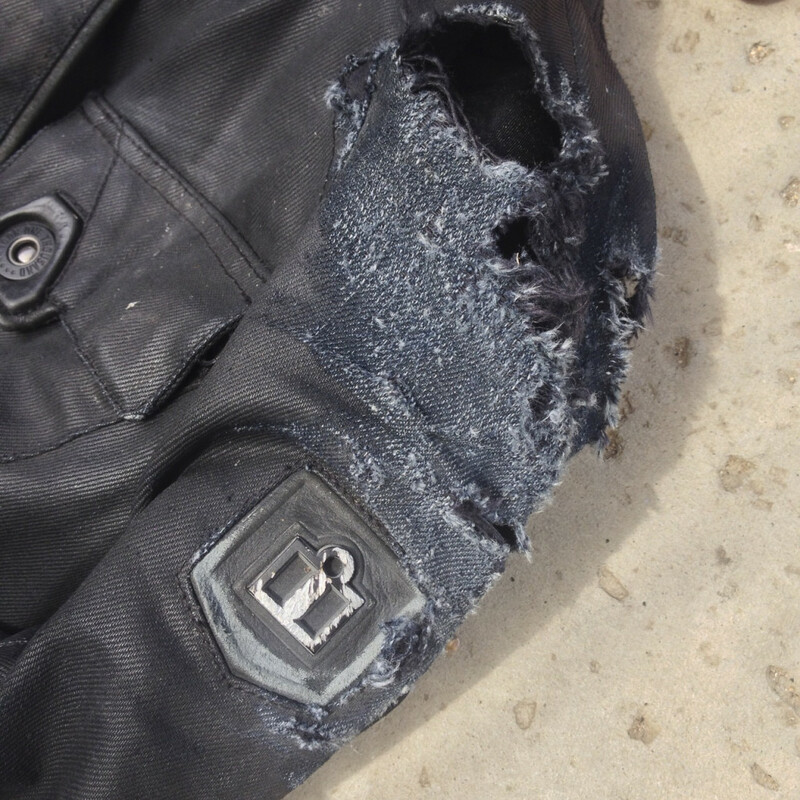 I came down hard on my helmet, scraped up every side of all of my gear, blew out a seam on my boots, rubbed through to the armor on my jacket, scraped through the knees of the riding jeans to the armor… the list goes on. The reason I ended up with road rash on my hip is because of improper fitment. 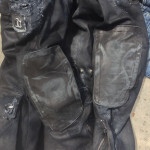 I lost about ten pounds recently, and my riding jeans were sitting below my hips. 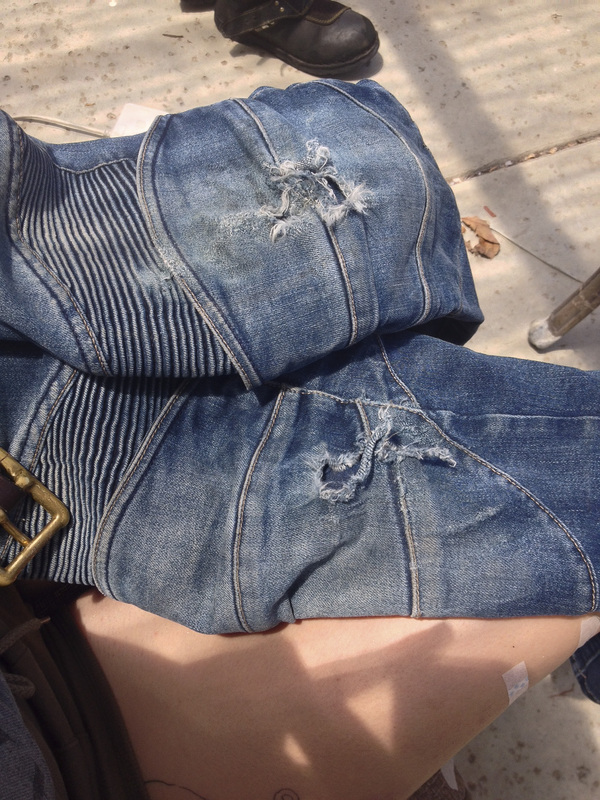 Usually they sit closer to my waist, but even with my belt on the last hole, they were somewhat baggy. 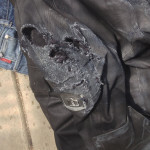 So when I was sliding feet first, my jacket pulled up a bit, my pants too low, it contacted the asphalt. Seriously, I stand by all of what I had on 100%. Every single side of my jacket got rashed up badly, my jeans took the beating like a champ, too. Make sure you click on the thumbnails so you can see the detail shots. 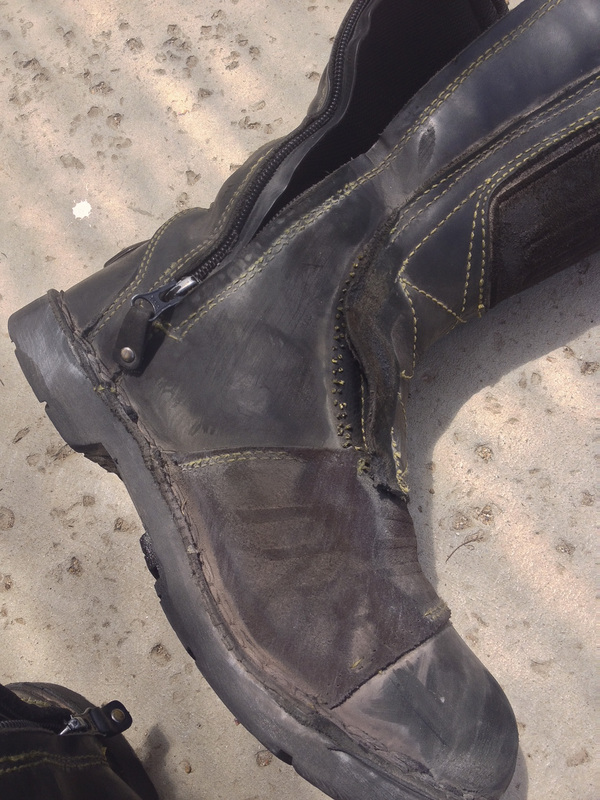 The inside of my Elsinore boots got blown out on one side and rashed up a little everywhere else, but kept my feet and ankles safe! 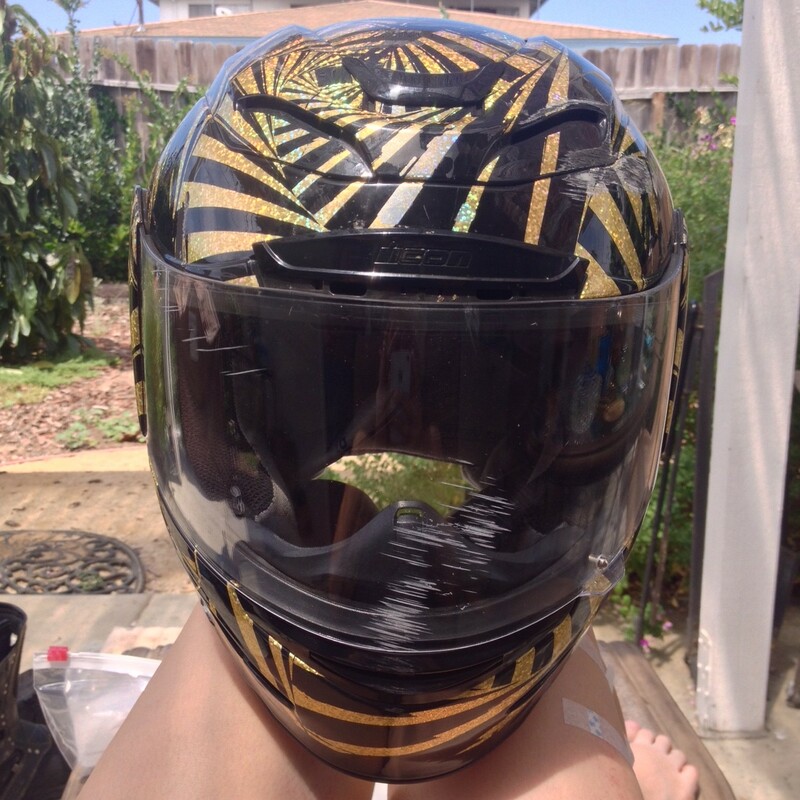 My full face helmet took a major beating- it has scratches all over it and across the face shield. Again so thankful to have been geared up and wearing a full face helmet. I can’t ride in anything less, never have been able to. 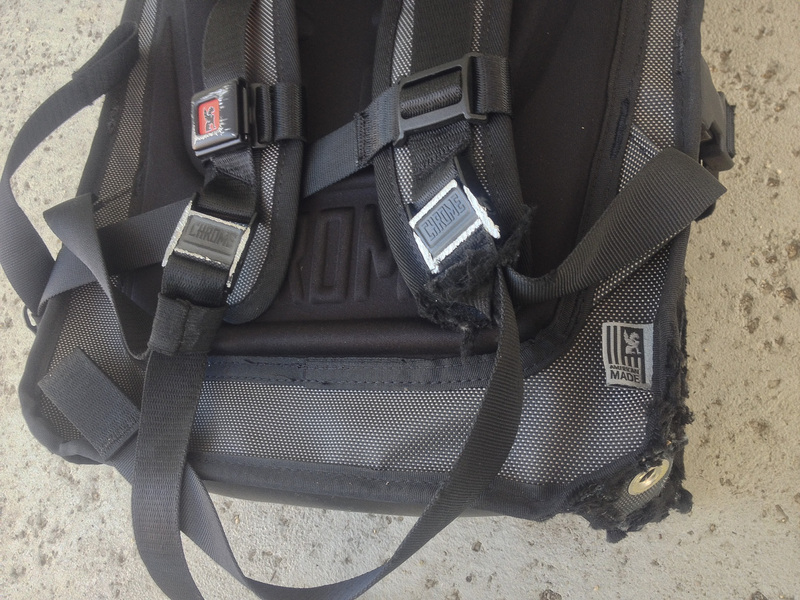 The Barrage backpack I was wearing from the Chrome Industries Motor collection helped me out too, no doubt. It also took a lot of the slide, and held up amazingly well. 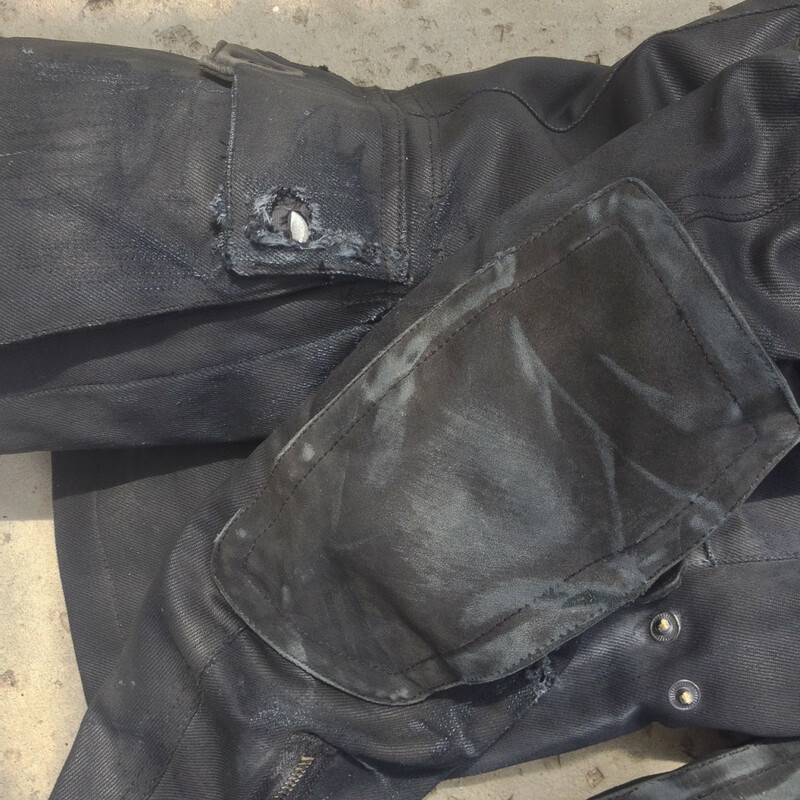 Some broken seams of course, but no holes, and it stayed on me through the whole ordeal. 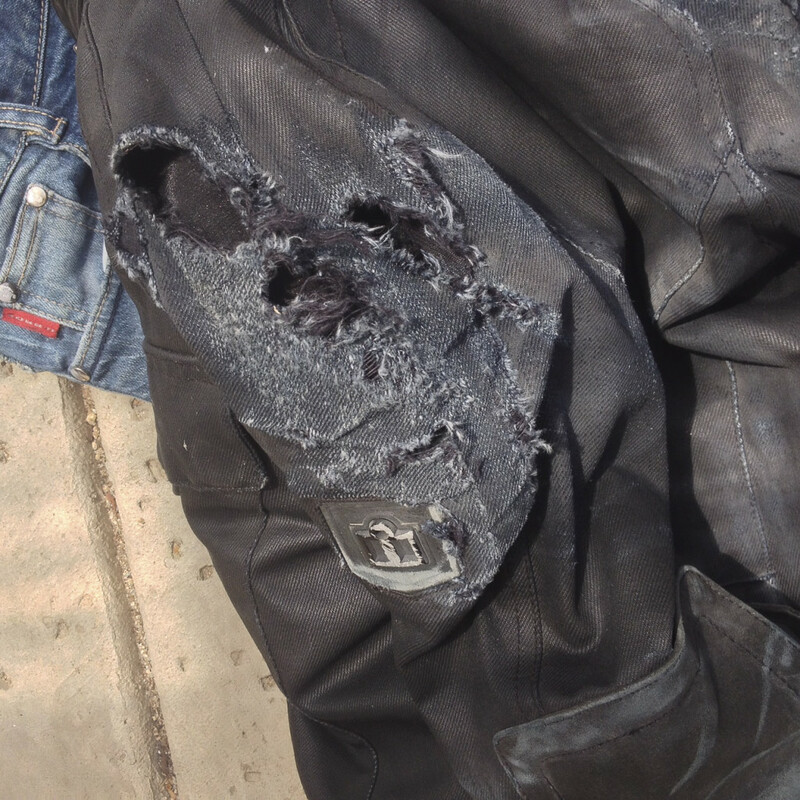 You can see on my jacket where the backpack gave me extra protection against the road. 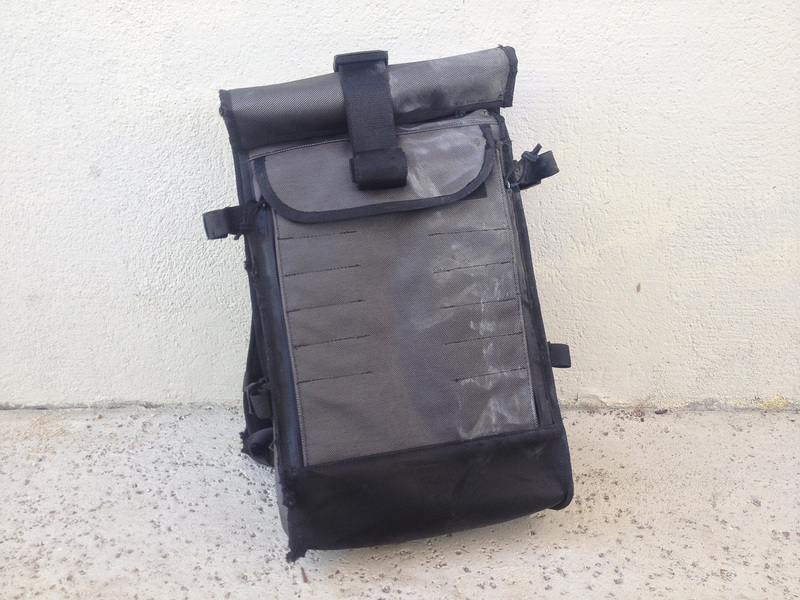 And yes, the Icon 1000 Akorp jacket has a back protector. At this point, after a full day of resting and tending to the road rash, my bruises are pretty nasty but it’s healing pretty well. Don’t look at these if you’re grossed out by… blood n stuff. 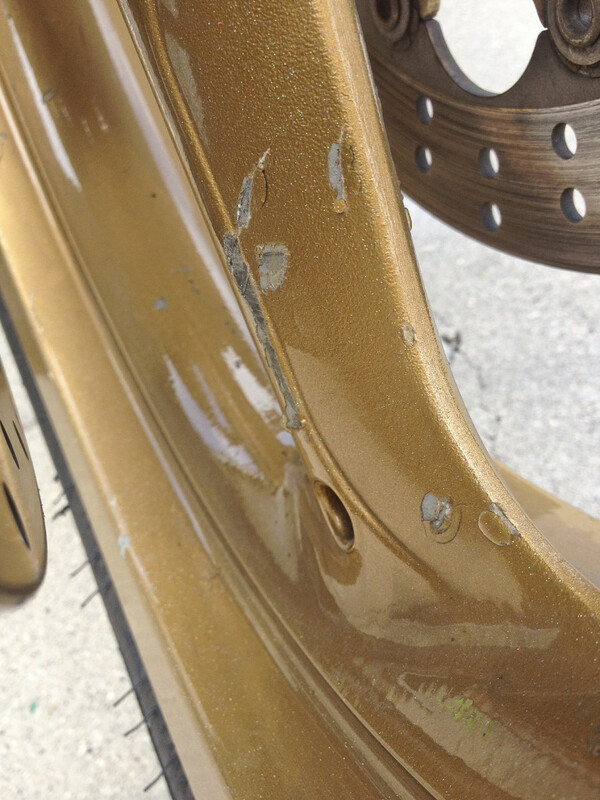 You can see lots of road grime hanging out in it. Gross. The big red spot on my hip is actually a pretty deep hole- pretty gross. Definitely the most painful part. 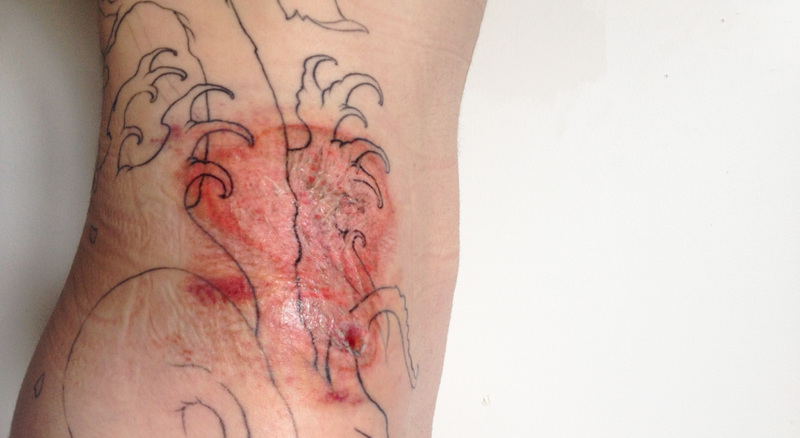 It’s super gross to see your tattoo imprinted on the bandages when you remove them like silly putty on newspaper. Someone asked me how I’m feeling mentally after crashing my motorcycle, and about getting back on a bike. Well, honestly, I can’t wait! It was definitely a scary experience- one that I hope to never deal with again. But the reality is that sometimes doing the things you love comes with unpleasant consequences. We all know riding motorcycles is dangerous. I feel absolutely happy to have landed metaphorically and physically where I did, as everything could have gone so much worse. I consider myself a good rider- I am confident in my skill level however I always want to get better, improve techniques, and learn more. So, I’ll be working harder on improving my technique via more training, trackdays, and miles. I also plan on improving my gear situation (proper fitment and attaching my pants and jacket together so this can’t happen again). I am excited to hop back on the proverbial horse. I’ll keep you guys in the loop of fixes (and hopefully upgrades?) to the Monster. I definitely want to put a steering stabilizer on there. It’s going to be a process… again. A little wake up call for me but more so for me to make sure my girlfriend Jennifer adheres to this, she has some good protective clothing now and I feel good about that but I am a leather jacket and jean guy but some rides you just have to make sure you are as safe as you can be in wearing protective apparel. I sure hope that she makes a fast recovery and I am going to be looking into some better gear as we start this riding season again with many shows and events to attend. 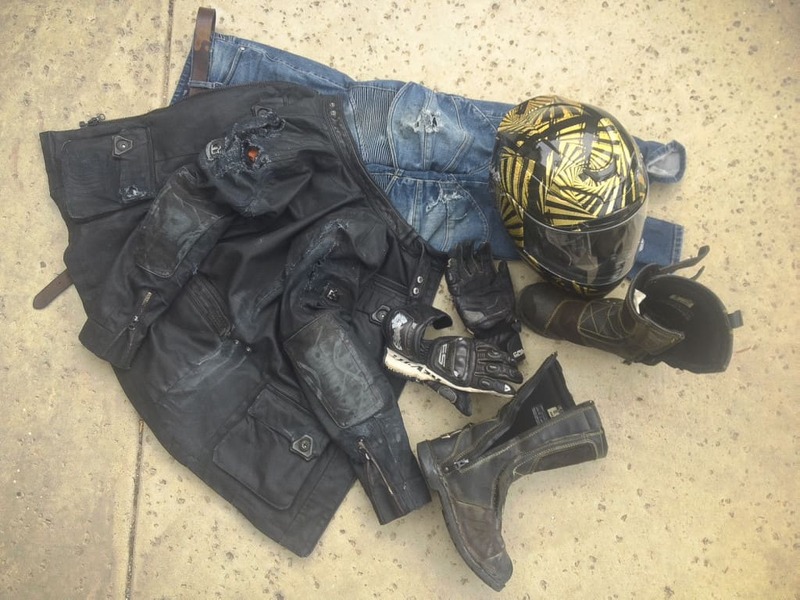 This entry was posted in Blog and tagged Be aware, boots, gloves, Helmets, highway riding, leather jacket, leather Pants, motorcycle safety, Protective clothing, safe riding, Sliders.